Lathom Park Trust has finished, for this season at least, a survey of Spa Roughs, on the edge of Lathom Park. 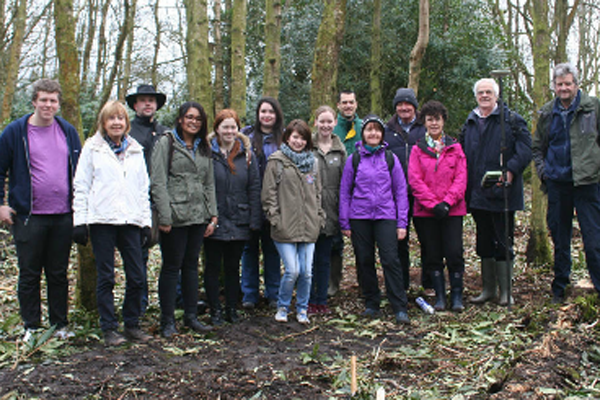 It's been a fantastic effort aided by a team of volunteers, that included students from Edge Hill University who braved all manners of weathers to discover more about Lathom's fascinating past. Not only did it mean facing the weathers, but also pitting ourselves against the vegetation. The area is woodland and there is a vast density of underbrush, more specifically rhododendrons which initially obscured everything. We used a large mechanical weed wacker to cut back rhododendrons at the beginging, but couldn't cut back all of it. So we still had an awful lot of fighting through dense vegetation leaving much of us looking dishevelled and woe begone. The most recent onslaught was having been faced with exploding balsam seeds, which explode in your face as you disturb them, and the seeds get literally everywhere - in your hair and your clothes and in your mouth if you are not careful. But it's all worth it if we can discover a little more about the complex history of Lathom, and we are genuinely getting a bit of an insight. The earliest element of our site would appear to be a medieval moated site, possibly occupied by the de Lathom family, and then the site was reoccupied by the Parliamentary forces during the siege of Lathom House in the Civil War. The results are vast, defensive ditches or dykes.